The United Kingdom and the European Union: Still an Awkward Member State? 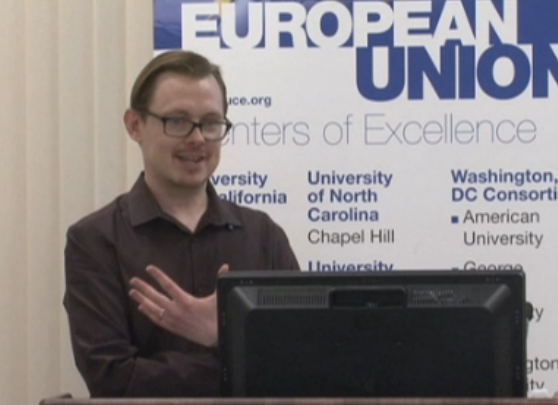 On April 11, 2014, Visiting Scholar Dr. Neill Nugent, from the College of Europe - Bruges, gave a EUC Visiting Scholar Lecture entitled "The United Kingdom and the European Union: Still an Awkward Member State?" Dr. Nugent's main points were that many of the policy issues that are likely to dominate the EU's agenda in the foreseeable future will see the UK government mostly well "onside." CHAMPAIGN — The European Union Center at the University of Illinois is pleased to announce that the University of Pittsburgh's European Studies Center has been awarded the European Union Centers of Excellence (EUCE) Outstanding Outreach Activity Award for their Conversations on Europe videoconference series. The Program was led by the Center’s Associate Director, Allyson Delnore. The EUCE Outstanding Outreach Activity Award was initiated by EU Center staff at Illinois to increase the awareness of excellent outreach projects conducted by the ten EU Centers of Excellence located throughout the United States. The review committee—comprising representatives from the Bulgarian Consulate in Chicago (Consul General Simeon Stoilov), the Lithuanian Consulate in Chicago (Consul General Marijus Gudynas), the Romanian Consulate in Chicago (Consul General George Predescu) and the Delegation of the European Union to the United States—acknowledged the success of the University of Pittsburgh’s submission for the award. 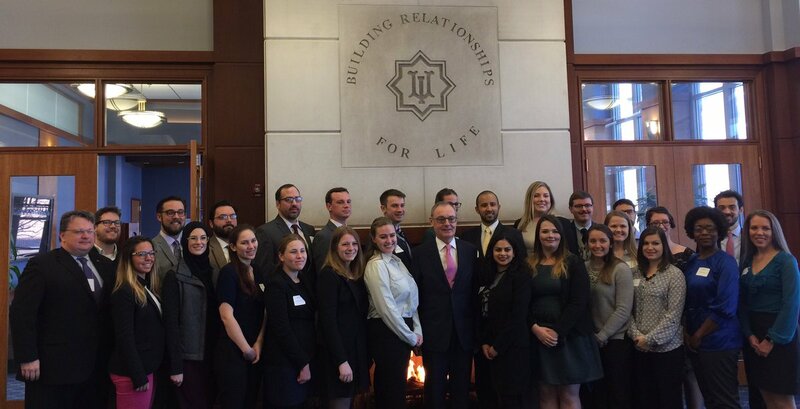 The University of Pittsburgh’s EUCE, along with the submitted activities of eight other centers, will be featured in promotional materials to be distributed domestically and throughout the European Union in an effort to promote EUCEs in the United States. 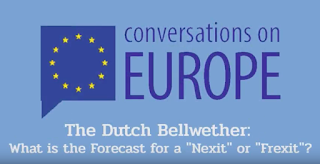 The Center's Conversations on Europe connect top experts from around the United States and Europe to discuss contemporary issues facing Europe. 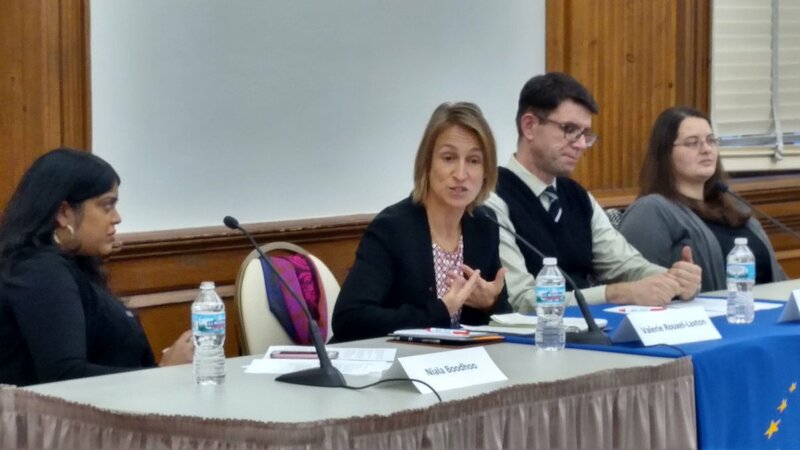 Using both personal and institutional videoconference technology, panelists take questions and interact with audiences at all sites. These events are open to the public. The Conversations are monthly interactive videoconferences on topics of transatlantic concern. Topics range from the Eurozone crisis, to EU-Middle Eastern relations, to the EU-US Free Trade agreement. Each Conversation is moderated by an on-site participant and panelists participate virtually from a number of remote locations. Students, faculty, and other interested parties participate at any off-site location and have the opportunity for questions and dialogue. 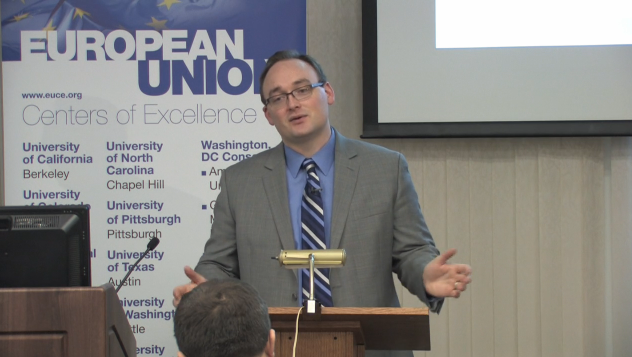 The EUCE at the University of Pittsburgh hosts approximately six Conversations per year. This post was originally published on Diplomatist Online in May 2014. 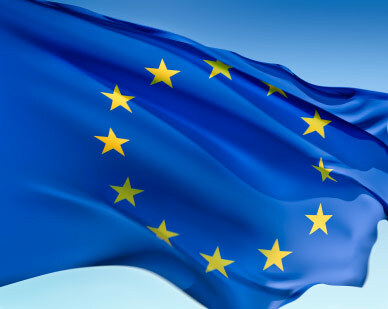 This is an election year in Europe, with a new round of European Parliament (EP) elections taking place in late May. These elections will have special significance, as they are the first parliamentary elections to follow the new rules instated by the 2009 Lisbon Treaty. These new rules, in combination with a surging support for far right parties, should create an unusually competitive political environment normally found only at the national level. Together, these two changes may carry important repercussions for decision-making in the European Parliament, including the disruption of a long-standing peace between its two largest parties. The European Parliament has two broad, powerful coalition parties: the centre-right ‘European People’s Party’ (EPP) and centre-left ‘Party of European Socialists’ (PES). These two groups frequently compete in a close race to acquire the most votes in this proportionally representative legislature. While the EPP has retained its plurality in recent polling, support for the party is far below its 2009 levels, giving the socialists a good chance to gain control of the Parliament for the first time in two decades. The decline in the EPP’s fortunes can be attributed to many outcomes, the most important of which includes dissatisfaction with the current global economic crisis. Lisbon’s rule changes could give this dissatisfaction the ability to reverberate throughout the EU’s institutional structure. Under the terms of the Lisbon Treaty, the Council’s nomination of the President of the European Commission must “take into account” the results of the recent EP elections. While it remains unclear how this will translate into practice, the head of the party that successfully forms a majority is expected to be the nominee for President. This expectation is based upon uncodified interpretations of the Lisbon Treaty which have been challenged by national elites, such as German Chancellor Angela Merkel. Until a precedent or operational norm is set, what “taking account” of the results from the EP elections means, will remain a source of uncertainty. Beyond issues in implementation, the new rules of the Lisbon Treaty may also change the political atmosphere of the EU. Since its inception, the European Commission has been tasked with the wellbeing of the European Union as a whole. The election of the President of the Commission will decrease the Council’s input on the position and create new ties between the Commission and the EP. These new ties could dramatically influence the character of the Commission. If the new president prioritises loyalty to the Commission and its ideals, there may be no observable change to the behaviour of this institution. However, if the new president prioritises the needs of his party in Parliament, this could politicise the Commission – historically a relatively neutral organisation with loyalties to Europe over party or nation. Any hints of the elected President favouring Parliament or his political party would dramatically increase the importance of future EP elections. The potential benefits of capturing the immense power of the European Commission would be too great for private interests and their lobbyists to neglect. This increase in stakes has not made it any simpler to pinpoint a winner in this upcoming election. This is largely due to smaller parties having unusually small shares of the vote, with the exceptions being the Socialists and their leftist allies, the European United Left – Nordic Green Left (GUE/NGL). Most of their votes have been going to an unusual group within the Parliament, the NI (Non-Inscrits, or in English, the Non-Attached Members). This group is primarily composed of representatives from Europe’s increasingly popular family of far right parties, which have seen a spike in popularity as dissatisfaction with the economic crisis and austerity measures led by the European Union has grown. While austerity’s effect was less pronounced during the 2009 EP election, its realities are much more apparent now. Europe’s far right parties seem to be the only viable alternatives to the European project. While many citizens vote for far right parties as an endorsement of their xenophobic ideologies, many more are using them as protest votes. The NI will play an important role in establishing the majority needed to nominate the President of the European Commission. Normally, decisions are made using the “grand coalition” between the EPP on the right and PES on the left. However, the appointment of the President of the European Commission cannot easily be negotiated over, as it is but one position. The EPP and PES normally share the position of President of the European Parliament, dividing the term into halves. The increased competition over this appointment has pushed the parties to field prestigious candidates such as the former prime minister of Luxembourg Jean-Paul Juncker for the EPP and prominent German politician Martin Schulz for the PES. If tension rises between the EPP and PES, the formation of future “grand coalitions” will become more difficult. The possibility for constrained cooperation between the EPP and PES forces both competitors to look at smaller established parties for possible alliances. However, new coalitions among ideological lines may be insufficient, as many polls suggest neither party can create a necessary majority without including NI members. The likely outcome of this situation will be very fragile coalitions that more closely resemble national legislatures. Far right parties have tried to organise their representatives many times in the European Parliament, but these attempts have been frequently met with failure, including, most recently, the Identity Tradition Sovereignty (ITS) group in 2007. The weakness of far right parties in the EP is linked to limited leadership personality, internal distrust, ideological incompatibility, and national pressures. The ITS, for example, collapsed due to an intra-leadership personality clash, when a perceived insult caused a crucial Romanian party to withdraw their support. Some might point to the attempts at an alliance between the Dutch “Party for Freedom” and the French “National Front”, especially after their recent successes in the 2014 municipal elections. It could be further argued that the foundations for such an alliance already exist in the European Alliance for Freedom (EAF), an organisation of mostly Western-European NI members founded in 2010. The EAF, however, has yet to take part in an election, and it remains uncertain if they can meet the requirements to be officially recognised. If Europe’s far right arranges a unified platform before the elections, this organisation could persuade hesitant voters that their votes are not being wasted or going to overly extreme candidates. It is likely that the EPP will have a dominant role in post-election politics. While its projected margin of victory over the PES is small and easily reversible, even if the PES does manage to attain a plurality, they will have a much harder time than the EPP in securing their majority for the vote for Commission President. The European Parliament only has two other official left-of-centre parties, the GUE/NGL and the Greens-European Free alliance (Greens/EFA). Thus, it is much less likely that these parties will summon the necessary number of votes required for a majority. Assuming that well-established national parliamentary norms apply to the EP, if the PES cannot form a working majority coalition, the EPP will be given a chance to try and form their own majority. The EPP has a more promising range of ideologically compatible options, including the third-largest party and past coalition member, the Alliance of Liberals and Democrats for Europe (ALDE), two smaller Euro sceptic parties, and the aforementioned non-attached members (NI). If no coalition can be made without the participation of NI members, observing national cases where the centre and far right were forced to cooperate is helpful. For example, in the aftermath of the Dutch 2010 elections, their centre-right plurality party and its traditional Christian Democratic ally did not have enough votes between them to form a right leaning coalition without some cooperation with Geert Wilder’s aforementioned Party for Freedom (PVV). After a lengthy cabinet formation process, the two centre right parties created a minority cabinet whose stability rested on the tenuous approval of the not officially included, Party for Freedom. The two parties adjusted their positions to satisfy some of the policy demands from PVV, but refused to grant their party members ministerial positions. This arrangement was ultimately unstable and collapsed in 2012. The European Parliament may follow the Dutch example. The EPP and their traditional ally, ALDE, could negotiate with individual NI members to form the majority required to approve Juncker as their candidate for the President of the European Commission. If the EPP is able to include smaller, established, conservative EU parties, the required number of NI members could be fairly small. Negotiations between the established EU conservative parties, as well as any efforts to reach out to NI members, may signal that the European Parliament is moving towards a “minority cabinet”. Such negotiations could involve trading limited progress on regional ambitions for cooperation during critical votes at the European level, which might be particularly attractive to Western European far right parties like Italy’s Lega Nord, Belgium’s Flemish Interest, or the United Kingdom’s UKIP. Far right parties from Eastern Europe like Greece’s Golden Dawn or Bulgaria’s Attack! Party are likely to be barred from these negotiations, as their very extreme political positions (such as the promotion of violence) make association with them politically dangerous for the centrist EPP and ALDE. It should be well noted that this kind of negotiation with the NI would only occur when cooperation between the EPP and PES is impossible, such as in the election of the Commission President. Cooperation with Western European NI members would likely be viewed as a necessary evil, which would incentivise the EPP to continue their long-standing “grand coalition” arrangement with the socialists whenever possible. While the far right will do far better than they normally do at the EU level, their lack of organisation and persistent in-fighting would cripple their ambitions and overall role in the EP. The only area of potential influence involves new regulations from the Lisbon Treaty on the nomination of the next Commission President. If the Council allows the Parliament to elect their party leaders as presidential candidates, this would create a situation where the EPP and PES would not cooperate easily. If the EPP wins (or is given the chance to form a majority), they may need to forge agreements with far right party members to elect Juncker to Commission Presidency. In creating this new zero-sum contest over the election of the President of the Commission, the Lisbon Treaty could create incentives for politics in the EP to resemble those typically found at the national level. Since 2011, there have been 135 treaty ratification processes played out in EU member states. 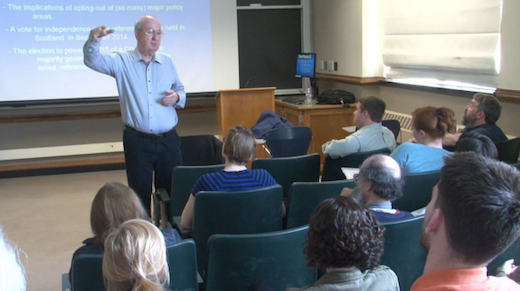 On April 2, 2014, Dr. Dermot Hodson, Senior Lecturer of Political Economy at Birkbeck College, discusses how ratification is achieved through referendum, constitutional review, and parliament voting. He argues that the ratification procedure is becoming more difficult and trust in the EU and national political systems is one of many determining factors in achieving a sense of two-level legitimacy. Michael Nelson, an M.A. 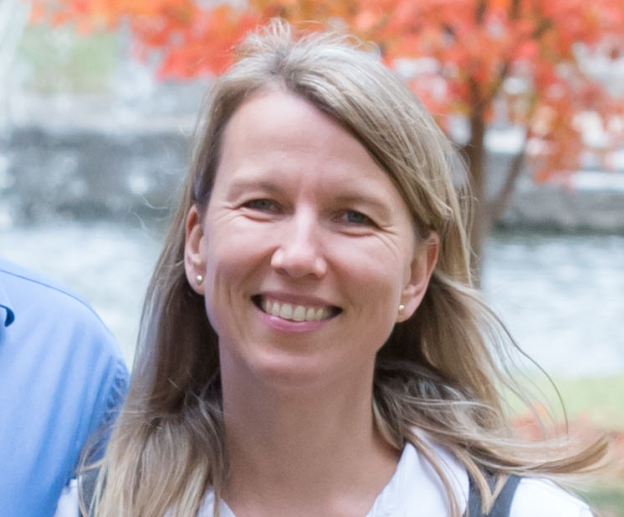 student in European Union Studies is the recipient of the Kungstenen Scholarship from Stockholm University, a one-time opportunity for an outstanding student from the University of Illinois at Urbana-Champaign to enroll in one of 76 different two-year Master's Programs offered in English in the Faculties of Humanities, Social Sciences, and Natural Sciences. The scholarship covers full tuition and living expenses at a total value of $70k. An interview between Michael and Harry Dankowicz, a Professor in Department of Mechanical Science and Engineering, is available in MP3 form from the INSPIRE website. Mike Nelson is a second year MAEUS student. 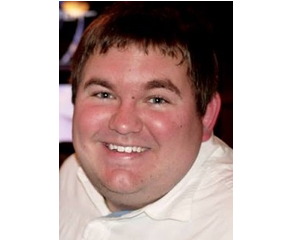 He received his Bachelor’s degree in Political Science from the University of Illinois in 2012. 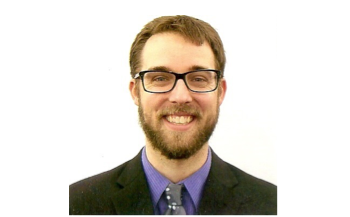 Mike works for the EU Center as a Graduate Assistant and as a Teaching Assistant for EURO 199: Dialogue on Europe, and he has also been a Teaching Assistant for PHYS/GLBL 280: Nuclear Weapons & Arms Control. During summer 2013, he interned for the Fulbright Commission in Belgium, where he was able to advise Belgian students about higher education in the United States. Mike has studied French, German, Italian, Spanish, and Swedish. His research interests include language policy, higher education, and EU governance. Harry Dankowicz is a Professor in the Department of Mechanical Science and Engineering at the University of Illinois and has held faculty positions in the Department of Engineering Science and Mechanics at Virginia Polytechnic Institute and State University and in the Department of Mechanics at the Royal Institute of Technology (KTH) in Stockholm, Sweden. He received his M.S. degree (1991) in Engineering Physics from KTH; and his Ph.D. degree (1995) in Theoretical and Applied Mechanics with minors in Mathematics and Astronomy from Cornell University. His research efforts further seek to make original and substantial contributions to the development and design of existing or novel devices that capitalize on system nonlinearities for improved system performance. INSPIRE's goal is to establish a transnational partnership alliance between the University of Illinois at Urbana-Champaign (Illinois) and three leading research universities in Stockholm, Sweden. This partnership was initiated with KTH Royal Institute of Technology (KTH) and quickly expanded to include Stockholm University (SU). We are now actively exploring potential avenues of collaboration with Karolinska Institutet (KI). Together, these top Swedish universities include faculties of engineering, humanities, law, medicine, natural sciences, and social sciences. This partnership alliance is a collaborative venture of well-matched, peer institutions and is expected to be fully reciprocal. This article was originally posted on the Daily Illini website on May 7, 2014. 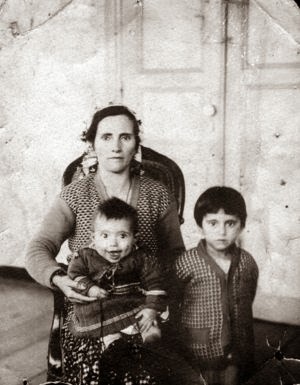 Her name was Eleni, and she was just a toddler when she and her siblings fled Turkey barefoot with everything they could carry during the forced migration of the early 1920s. to flee Greece with her five children. With her brother at her side, disguised as a girl so the Turks wouldn’t take him, they set off toward boats that were sent to help evacuate her coastline town, Smyrna, and headed to their new life in Greece. They arrived at Pirea, the main port of Greece and began their new life in a country that saw them as dirty and not Greek. Returning home, where they were also viewed as outsiders, wasn’t an option. She married at 16 and moved to a makeshift home that the community built for all of the migrants. “The community built these huge apartment complexes for them and that’s where a lot of the refugees — they don’t like to be called refugees — a lot of the individuals that came from Smyrna settled in,” McDonald said. 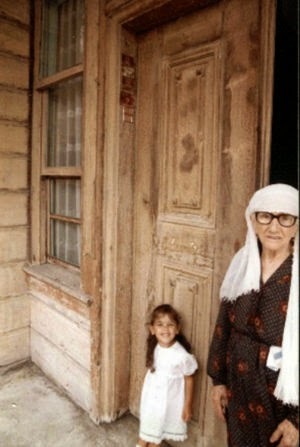 She lived in a town called Peristeri until her death in 1999. In English, Peristeri means dove, the symbol for peace. The Greek-Turkish exchange, German-Polish exchange, Partition of India and Cyprus Crisis are all events of forced migration in the 20th century, when millions of people were forced to leave their homelands, largely never returning. The documentary “Twice a Stranger” combines video testimonies, rare film archives and photos from survivors to bring their stories to light. The film will be shown by Modern Greek Studies at 6 p.m. on May 8 in the Lucy Ellis Lounge of the Foreign Language Building. Dr. Stefanos Katsikas, director of Modern Greek Studies, will begin the screening with a short introduction to provide background on the historical events being highlighted. “Twice a Stranger” premiered at an exhibition in the Benaki Museum in Athens and was highly successful, Katsikas said. He had to receive permission from the museum to show the documentary, making this the first time it will be screened in the Midwest. A conflict between Greece and the Ottoman Empire in 1919 led to a war over control of the region around Smyrna. The Greek army was granted a mandate after World War I to exercise control of the region for five years followed by a referendum which would determine the future status of the area, Katsikas said. Greek authorities took advantage of a strong presence of ethnic Greeks in the area. The outcome of the referendum would be in Greece’s favor and the region would become Greek territory. This was not seen favorably by Turks who wanted this region to be part of the Ottoman Empire or any succeeding Turkish nation state. Greece lost the war, and its troops withdrew, which sparked a negotiation between the two sides over the territorial status of Greece and Turkey, ending the signing of the Lausanne Peace Treaty. Part of this treaty was a protocol which provided for the compulsory exchange of populations so that all Muslims living in Greece moved to Turkey and all Greek-Orthodox people in Turkey would head to Greece. It was believed that a population exchange would guarantee peace and security between the two states. A conflict between Greece and the Ottoman Empire in 1919 led to a war over occupying territory in Turkey. While Greece was granted a mandate after World War I to occupy the region, Greek authorities in Smyrna were working on a five-year referendum that would determine the fate of the same area. Greece lost the war and its troops were forced to leave, which sparked a negotiation: the two states would exchange populations so that all Muslims living in Greece moved to Turkey and all Greek-Orthodox people in Turkey would head to Greece. Katsikas said one of the problems with this was many Muslims couldn’t speak Turkish and many of the Greek-Orthodox couldn’t speak Greek, causing them to be viewed as outcasts. Today, McDonald’s extended family still lives in the suburbs of Athens. Eleni and her husband were able to move out after buying land and building a new home. McDonald remembers her grandmother as quiet and not very talkative, but she was strong in her values. On the other side of the conflict stood Esma, a Turkish woman who was forced to flee Greece with her five children. The hardships they encountered took the life of one of her twins. Sebnem Ozkan, outreach coordinator at the European Union Center, said her great-grandmother remembered packing all of their belongings and taking the trip to Turkey. Esma and her family migrated to Sakarya, Turkey, where they ran an olive business to support themselves. Economic hardship after migrating was common because not all belongings could be taken with them, Ozkan said. The migration didn’t happen in a single day. Political tensions had been brewing and the people knew they would have to leave, but they kept a separate identity, Ozkan said, although that identity has been withering away with each generation. 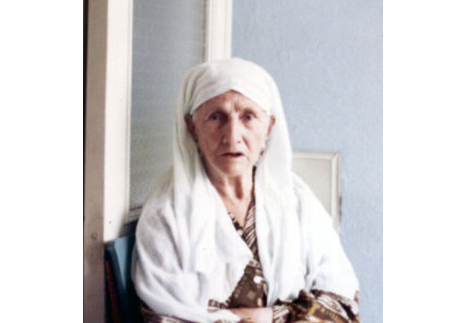 Like Eleni, Esma and her family also had trouble assimilating and were not welcomed. Even though they spoke Turkish, a difference in customs made them look suspicious. She never returned home but also never expressed the desire to. Esma lived to be more than 100 years old despite facing so many challenges in life, including losing her husband in the war. Brittney can be reached at banadle2@dailyillini.com. Photos courtesy of Sebnem Ozkan. This article was originally posted on the University of Birmingham webpage on May 6, 2014. Dr. Dixson's trip to Birmingham is partially supported by funding from the EUC's European Union Center of Excellence grant. The Centre for Research in Race & Education (CRRE) is delighted to welcome Dr Adrienne Dixson from the University of Illinois at Urbana Champaign (UIUC) to the University of Birmingham for an extended visit during May 2014. Dr Adrienne Dixson is Associate Professor of Critical Race Theory and Education in the Department of Educational Policy, Organisation and Leadership, at UIUC. 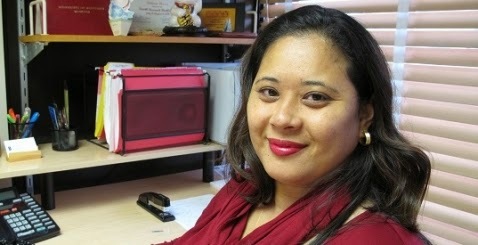 Her scholarship focuses on the intersection of race, class and gender in urban educational contexts. Dr Dixson is co-editor of the Handbook of Critical Race Theory in Education (2013) and widely acknowledged as one of the most important figures in the new generation of critical race scholars internationally. She will be visiting the University of Birmingham for 12 days during May 2014 as a guest of the Centre for Research in Race & Education. Dr Dixson’s visit highlights the strength of the relationship between CRRE and UIUC. It also complements the wider strategic partnership between the University of Birmingham and the University of Illinois at Urbana-Champaign, recently cemented by the signing of the BRIDGE (BiRmingham-Illinois Partnership for Discovery EnGagement and Education) agreement. Dr Dixson’s visit provides a direct example of how universities are working together to enhance their research, strengthen collaborations and demonstrate global impact.